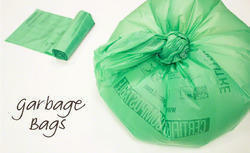 SAC Biodegradable plastic bags have the same strength as ordinary plastic and cost very little extra. They will degrade then biodegrade if they get into the open environment, but they can be recycled if collected during their useful life. They are designed so that they will not degrade deep in landfill and will not therefore generate methane. Biodegradable plastic is bio enzyme by the same bacteria and fungi, which transform natural material such as twigs and leaves to cell biomass, like lignocellulosic materials. Bio degradable plastic is designed to degrade initially by a process which includes photo-oxidation and thermo-oxidation, so it can degrade in the dark.